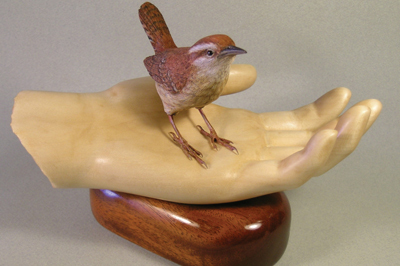 In 1995 I attended my first meeting of the Central Texas Woodcarvers Association, where I found people to be friendly and willing to help a newcomer. It was so instructive seeing how some of the more experienced carvers made the chips fly from their carving knives. No more would I hack away in frustration with a hobby knife on a hunk of mesquite (Prosopis juliflora) wood! 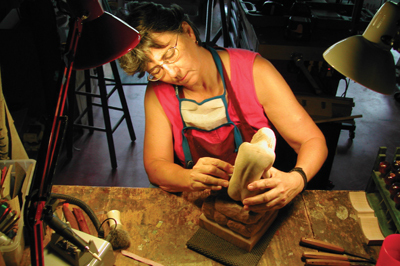 By attending many workshops put on by the Texas Woodcarvers Guild, I learned how best to teach others how to carve. By the second year I was holding my own classes and very much enjoying teaching. I have now been teaching for 15 years and it is still as much fun as it was in the beginning. Creating something beautiful. 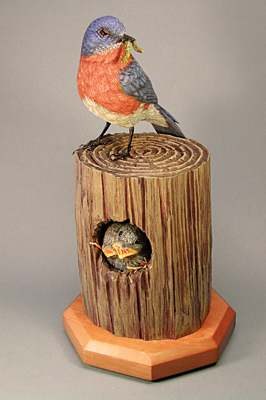 Capturing nature in all its glory - in wood. 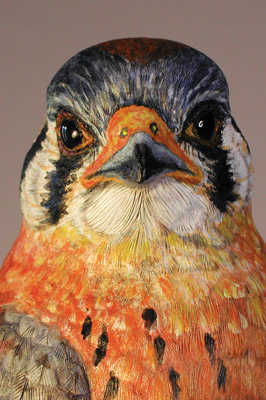 With my background in scientific illustration I try to get as close as I can to reproducing in wood what I see with my eyes. Sometimes I feel that I have succeeded - sometimes not! I enjoy teaching, a lot, but not everyone can make it to my classes, so I have made a few videos in order that they can learn as though they were in my class. After making the carving of the wren on the hand, I decided that I should make a video showing others how to carve birds without using power tools. Since I simultaneously generate a magazine article showing the process, it takes a bit of time to complete. My Helvie bench knives are my 'do everything' tools. I won my first knife when I placed well with a bird carving in 2001 at the International Woodcarvers Congress in Iowa. After experiencing how well the handle filled my hand and how long the blade stayed sharp, I bought another Helvie knife, but this time with a bigger blade. Which is your preferred style of carving and why? 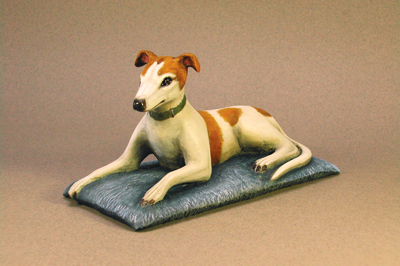 I like to carve realistic animals in the round. Although I mostly work in basswood (Tilia americana) to be wood burned and painted, I also enjoy the challenge of working in harder woods like mahogany (Khaya ivorensis) and butternut (Juglans cinerea). My biggest and best carving achievement is always the one I've just completed. After time passes, the older pieces fade into the background and the latest becomes my favourite. With each new piece I want to challenge myself to do ever-better work, and to that end I work very hard. I admire Ian Norbury very much. His figures are wonderful and amazing. I swear it looks as though he has shrunk real humans down to size. The carver from whom I've learned the most though has been Desiree Hajny. I was fortunate to be able to take some of her classes and I give full credit to her teachings for my lifelike small mammals. If you weren't a carver what would you be? I was involved in classroom teaching when I got into carving, and I may well have continued on that path if I hadn't gotten more involved in woodworking. Teaching adults how to carve and do other woodworking, by the way, is much more enjoyable than teaching elementary school children how to do maths! Describe the view from your workshop/workbench. I live on a small cattle ranch in central Texas and I can see cattle walking by and chickens pecking for insects - when they are not being chased by coyotes. Sometimes a great blue heron will fly by from one cattle pond to the next - distracting, yes, but refreshing too. Working on commissions has been very important in keeping my interest in carving. I like the idea that someone wants to own a piece I have made. I like to work with a patron to determine exactly what they want and then do my very best to fulfil that obligation. What do you listen to whilst carving? Music. Doesn't matter much what kind, though I usually have the classical station on, but just something playing helps with concentration. Sometimes I could not even tell you what I'd been listening to, but it works in any case. What are your interests outside of carving? Ever since making my first harp in 2007 I have been trying to teach myself how to play it. All I can say about that is I make a better harp builder than I do a harp player, but I'll keep trying. I also very much enjoy taking photographs of butterflies and dragonflies. So far I've captured 43 different butterflies in decent digital images by traipsing over our acreage for hours at a time. Life doesn't get much better.